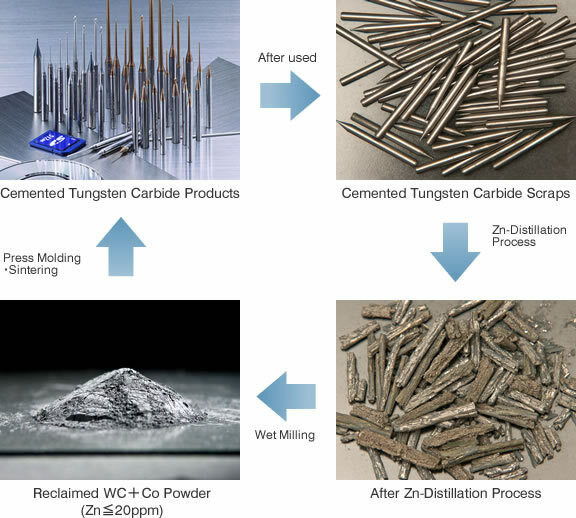 As the Zn-distillation process has limitation of productivity and products’ species, we have developed an ionization process for reclaimed cemented tungsten carbide scraps. In the ionization process, the binder metal is ionized into liquid solution and WC particles are left alone. The WC powders which are recovered by this process have the same or close-to quality as virgin powders. Kohsei Kitakyushu plant started recycling cemented carbide scraps such as WC rolls, drills by Zn-distillation process since the plant was built in Feb 2000. It is known that the cemented carbide is composed by super-hard particles (WC, TiC, VC, etc) and binder metals (Co, Ni, Fe, etc). In the Zn-distillation process, melt Zn dissolves the binder metals so that the hard particles could fall apart easily. After Zn is evaporated at elevated temperatures, binder metals precipitates on the surface of hard particles. The distillated alloy is milled into fine powders finally. 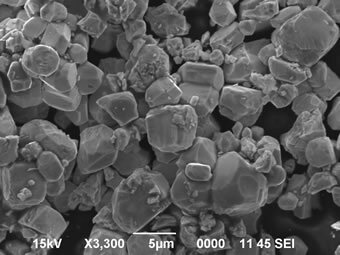 One of the advantages of Zn-distillation process is that the reclaimed cemented carbide powders have the same chemical composition as raw materials. Besides, it is an economical and environment-friendly process which does not generate any wastes and pollution. With the shortage of the supply and increase of prices of raw materials, demands for reclaimed products have been rising. More and more reclaimed WC products are used for cemented tungsten carbide products. Our plant always takes the quality assurance as our first priority and follows the regulations of environment protection, personal health and laws. We have established our new analysis center and installed many advanced instruments such as ICP, AES, SEM, EDS, Fluorescent X-ray, PSD analyzer. The more accurate and repeatable analysis and evaluations make our products more reliable and stable. *We can customize specifications to meet customers' needs. Please feel free to contact us. *The tolling service of cemented tungsten carbide scrap is also available at our plant. *We purchase cemented tungsten carbide scraps at any time.